To assess pain, functional disability, surgical status, and health care use of patients who actively selected complementary and alternative medicine treatment and risk factors for lumbar surgery. Controversy continues regarding difference in long-term outcomes of conservative and surgical treatment. 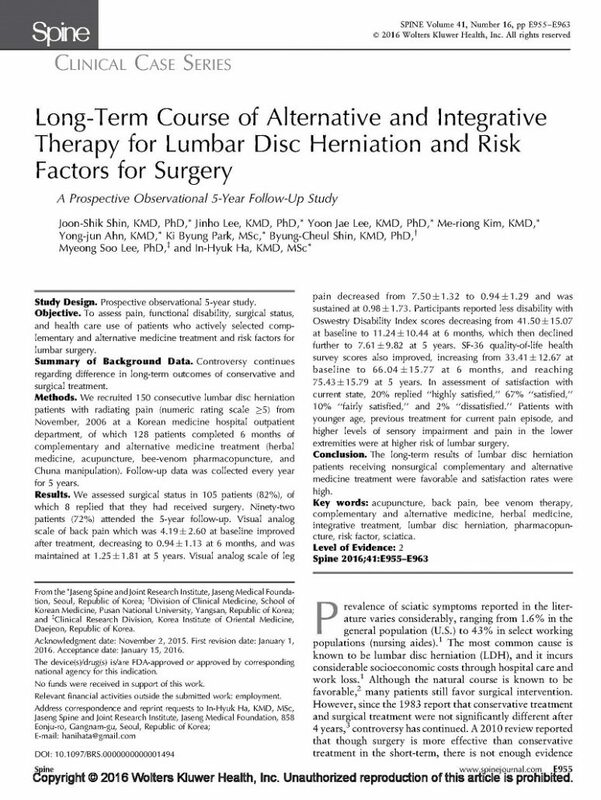 We recruited 150 consecutive lumbar disc herniation patients with radiating pain (numeric rating scale ≥5) from November, 2006 at a Korean medicine hospital outpatient department, of which 128 patients completed 6 months of complementary and alternative medicine treatment (herbal medicine, acupuncture, bee-venom pharmacopuncture, and Chuna manipulation). Follow-up data was collected every year for 5 years. We assessed surgical status in 105 patients (82%), of which 8 replied that they had received surgery. Ninety-two patients (72%) attended the 5-year follow-up. Visual analog scale of back pain which was 4.19 ± 2.60 at baseline improved after treatment, decreasing to 0.94 ± 1.13 at 6 months, and was maintained at 1.25 ± 1.81 at 5 years. Visual analog scale of leg pain decreased from 7.50 ± 1.32 to 0.94 ± 1.29 and was sustained at 0.98 ± 1.73. Participants reported less disability with Oswestry Disability Index scores decreasing from 41.50 ± 15.07 at baseline to 11.24 ± 10.44 at 6 months, which then declined further to 7.61 ± 9.82 at 5 years. SF-36 quality-of-life health survey scores also improved, increasing from 33.41 ± 12.67 at baseline to 66.04 ± 15.77 at 6 months, and reaching 75.43 ± 15.79 at 5 years. In assessment of satisfaction with current state, 20% replied “highly satisfied,” 67% “satisfied,” 10% “fairly satisfied,” and 2% “dissatisfied.” Patients with younger age, previous treatment for current pain episode, and higher levels of sensory impairment and pain in the lower extremities were at higher risk of lumbar surgery. The long-term results of lumbar disc herniation patients receiving nonsurgical complementary and alternative medicine treatment were favorable and satisfaction rates were high.